These magnetised dials are great to keep track of wounds, command points, turns... anything! The top part is a colour of your choosing and the base is black. They can be 30mm, 40mm, 50mm or 60mm in diameter. 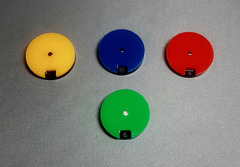 They can track the numbers 1-10, 1-15, 1-20 (50mm and 60mm only) and 1-25 (50mm and 60mm only).